Theme 2 | Is NATO Ready? In March 2011 NATO entered a conflict in Libya. The North-Atlantic Council decided that measures to protect civilians and populated areas under threat of attack should be implemented in accordance with UNSCR (United Nations Security Council Resolution) 1973, and should continue until no longer required. In effect, UNSCR 1973 mandated NATO to conduct oper­ations. However, at that time, NATO was not ready. The Alliance did not have the right mindset to assume a mission to monitor an arms embargo, enforce a no-fly zone, and protect civilians, because it had not prepared or planned to do so. There was not a synchronization of kinetic, non-kinetic, lethal and non-lethal capabilities, nor an adequate number of staff officers trained to plan for combat operations; the focus had previously been on peace support operations, humanitarian assistance and disaster relief. NATO learned a number of lessons from the experience of Operation ­UNIFIED PROTECTOR, and the Russian seizure of Crimea in 2014 increased the sense of urgency to return to a better state of preparedness for larger-scale conflict as opposed to the out-of-area peacekeeping and stability operations that dominated the late 1990s and early 2000s. As a result, the Alliance has been gradually improving the organization and training of the Joint Force Commands and their warfighting components over the last several years, in order to better prepare for the full spectrum of possible conflicts, but we aren’t there yet. The Washington Treaty delineates the actions and efforts NATO may take when faced with an attack. Under the terms of the treaty, NATO nations may provide military support to one another as they see fit. Article 3 will allow each member state of the Alliance to defend itself and come to the assistance of others. In addition to Article 3, Article 4 allows for multi-national consultation. If, in the opinion of any member state, the political integrity, territory, or security of another member states is threatened, any member state can call for Article 4 consultations. The obligation of the other 28 members is to listen, but not necessarily agree with, what is being said. Article 4 consultations rarely end with a decision made by the North Atlantic Council, but they do foster communication and support good ­decision making. Today, statements on discussions are made public. The main reason for doing so is deterrence, this is a public affirmation that NATO is aware of what is ongoing and demonstrates solidarity among NATO nations. In response to threats, NATO must evaluate its readiness to respond. The clarity of the Cold War is long gone and the recent focus on VEOs can no longer be exclusive in a world that is almost all fog accompanied by friction. 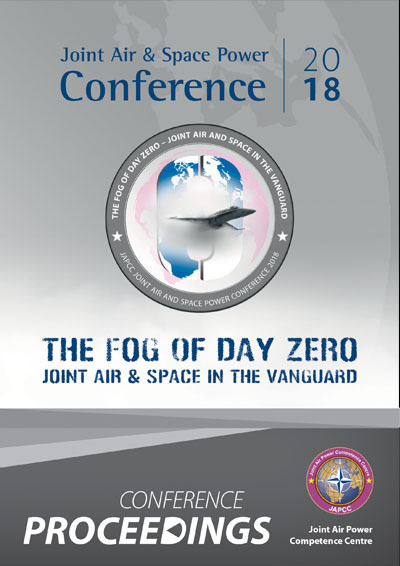 NATO does not know where or when Day Zero will come, or if it is already here, so how does NATO collectively prepare and make ready for conflict in this fog? The United States Air Force Chief of Staff, General David L. Goldfein, recently acknowledged that there are more warfighting domains than there used to be. This can be described by expanding Longfellow’s phrase from ‘one if by land, and two if by sea’ to ‘three if by air, four if by space, and five if by cyberspace’. The electromagnetic spectrum and information operations could be seen as the ‘sixth’ and ‘seventh’ of this multi-domain world. Perhaps it is most important to understand that these attacks will likely come in more than one of those domains and they will come simultaneously. Currently, in order to operate, NATO responds quickly to perceived enemy action but is highly constrained. To complicate the issue, NATO’s ­staffing processes are slow which causes friction. Therefore, there will not just be fog but also friction during Day Zero which will carry on through open hostilities on day one of conflict. To cope with this situation, NATO forces must organize, train, equip and prepare command and ­control processes using long-term planning ahead of time and supplemented with contingency planning. To prepare for potential hostilities, accurate intelligence, situational awareness and indications and warnings are essential to enable an appropriate response. The question is how to detect and manage actions in the fog of Day Zero to prevent ‘Day One’. The answer may well be deterrence. ­Deterrence, to be effective, must be based on facts and supported by strong evidence. Deterrence implies readiness, which means ready assets, capabilities, realistic training and plans. Plans must be actionable and aimed at delivering effects. For deterrence to be effective, unambiguous Strategic Communication to potential adversaries is essential. The adversaries must be convinced that NATO is ready and that there would be a price to pay should they attack. Effective Strategic Communication implies that NATO has the political will, the plans, the assets, the capabilities and is ready to use them. When looking at how NATO can address emerging security challenges using Air and Space Power, there are four realities to keep in mind. The first reality is considered the ‘power reality’, the ability to project power. The combined GDP of the NATO Alliance exceeds 36 trillion dollars, so there is no financial impediment to NATO’s projecting military power. The second is the ‘transition reality’, the ability to transition from peace to conflict. When deterrence fails, prompt consensus is pivotal, and the transition to collective defence must be decisive. The third is the ‘threat reality’, which is probably the most important with respect to Day Zero. There can be up to 30 different views of the threat, one for each Alliance member and still another of NATO’s collective view. In conjunction, the enemy can choose to enter into war, this is a new situation for the ­Alliance; deterrence has always worked. Finally, there is the ‘force reality’, the reality that NATO forces must be ready, deployable, and sustainable to be fully combat capable. Another problem facing NATO is that there is no existential threat perceived by the population nor by the politicians in the manner that was present during the Cold War. Nobody believes that even near-peers pose a threat to our existence or our way of life. Over the last 20 years NATO enjoyed the luxury of engaging in out-of-area counterinsurgency oper­ations and hybrid conflict. Against a peer competitor NATO would not ­enjoy the luxury of using the ROE and caveats normally used in counter­insurgency operations. In addition, this shift may produce a different popular opinion of civilian casualties and collateral damage. NATO needs to adapt to regain relevance both in defence and regarding broader security matters. The danger of not adapting is twofold. The first danger is the possibility of an inadequate response due to lack of resources. It is extremely difficult to advocate for defence resources when taxpayers do not see clear indications of a threat against which to defend. This leads to the budget cuts, force reductions and failures to modernize that we have all witnessed firsthand. Secondly, and an even more challenging risk, is NATO’s lack of adaptation to the new and ever-changing scenarios. Just like NATO, the general public must also prepare for Day Zero and adjust their mindset and threat assessment to that of a peer or near-peer adversary (Sweden, as an example, has undertaken a campaign to educate and prepare their population just so). NATO has to be able to synchronize joint operations to achieve joint effects. Greater authority should be delegated to the military to conduct readiness and response exercises and realign forces, otherwise by Day One, time will have been lost and with it, potentially, the battle. Protection of NATO assets must be at the forefront of planning. Logistics and reinforcement areas that were once considered secure, due to being positioned in isolated and inaccessible rear areas, can no longer be considered safe havens. Since the end of World War II, NATO has enjoyed relatively unchallenged supply lines whether moving forces domestically or around the globe. In the face of reinvigorated near-peer competitors with tools including cyber, counter-space, hypersonic missiles, etc … it is no longer safe to assume that Alliance lines of communication will remain uncontested. These ‘rear areas’ must be better protected and made more resilient. To address this, the Alliance established a new operational command to counter these threats, the Joint Support and Enabling Command (JSEC). Among the JSEC’s tasks are ensuring mobility, providing force projection, providing logistic support, enabling of the AOR, cross-border operations, protection of critical NATO installations, and counter hybrid operations. The JSEC also has to enable training and integration and is responsible for the RSOM process (Reception, Staging, and Onward Movement) of NATO follow-on forces. The objective is to ensure freedom of operations and sustainment in the rear area in support of Alliance operations. In crisis, JSEC will function at the same operational level as the Joint Force Command HQ. In peacetime, it will support any NATO Command Structure (NCS) entity during Baseline Activities and Current Operations (BACO). During the BACO period, the JSEC’s main task will be establishing a solid network and coordinating between nations the processes and procedures for SACEUR’s rear area that could, if interrupted, hamper the swift and effective reaction of NATO to a crisis situation. The important concept here is readiness. The plan is for the JSEC to achieve IOC in September 2019 and FOC in September 2021. In addition to rear area security, there remains the ongoing requirement to deploy, defend, receive forces, fight and continue to operate. This means that protective structures on NATO air bases must be reinforced. Aircraft are now parked in hardened aircraft shelters of 1980 vintage, ­designed to withstand a nuclear blast. Some of the protection they ­offered may still be relevant, but the threats are changing. Today parked aircraft must be protected against threats such as swarming UAVs including those with CBRN elements or capable of generating electronic ­warfare effects. Directed energy weapons and high-performance ­microwaves could cripple electronic systems. Cybersecurity is another critical aspect due to modern systems’ dependence on information technology and computer and information systems. Ground-based air-defence (GBAD) must also be modernized. Ground-based personnel must also be able to work under CBRN conditions. Space-based capabilities provide critical information on a daily basis for commercial, civil, humanitarian, diplomatic, and military activity. Space used to be a sanctuary, unreachable to all but a few nations, but that is no longer the case. Despite the rapidly expanding number of actors who can access or affect space, and the inescapable dependence on space-based capabilities, NATO appears slow and perhaps reluctant to acknowledge that space has become a warfighting domain, and this is a concern. The potential threats to NATO space capabilities are complex and the list is long.